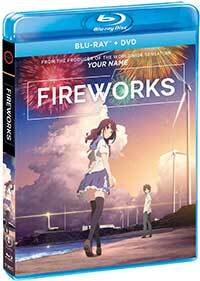 Fireworks is the anime feature film from director Shinbō Akiyuki (Puella Magi Madoka Magica) based on the Japanese live-action television play Uchiage Hanabi, Shita kara Miru ka? Yoko kara Miru ka? (Skyrockets, Watch from Below? Watch from the Side?). The story follows a group of male classmates, Shimada Norimichi and his friends, Yusuke, Miura, and Junichi, who debate whether fireworks look flat or round when seen from the side. They are also lamenting the imminent departure of their beautiful female classmate Oikawa Nazuna, who is set to move to a new town with her mother and new husband. The boys plan to settle their debate at the forthcoming festival and Nazuna plans to run away from home, angry at her mother’s decision to remarry and move away. The night of the fireworks, Nazuna finds a strange marble ball by the sea and after school, when friends Norimichi and Yusuke come across her at the school’s pool, she challenges them to a race, and says she will go on a date with the winner. Yusuker wins, but later stands her up. Norimichi runs into Nazuna as she is running away from her mother and he falls into possession of the small marble ball that Nazuna had found. Eventually, he realizes there may be more to the item than appears to the eyes, and he finds himself back in the school gymnasium swimming pool and winning the swim race. A resulting date between Norimichi and Nazuna with her parents and his friends on their trail results in some fantastical time-twisting events. From the producer of the heartfelt anime film Your Name, Fireworks seems like an amazing idea on paper and the core teen romance, ideas of fear of the unknown and uneasiness about one’s future are strengths anyone can relate to; we have all been through that period of youth where growing pains, family changes, and new places upset our already hormonally volcanos emotions. Where this film begins to fall apart is in its confused timeline of events, albeit bolstered by amazingly animated sequences full of color and detail. It’s always a difficult task to craft a story that plays with time, and one of the last anime films I saw that did it effectively was The Girl Who Leapt Through Time. In Fireworks, it feels like a tacked-on gimmick to help push a flagging story forward and it leaves some plot holes wide open. The film hits Blu-ray in an AVC 1080p encodement framed at 1.77:1. The digital animation for this film looks generally good in this transfer, with excellent colors that aren’t oversaturated and detail that’s crisp. The only issue is some color banding in the fills here and there. The original Japanese-language mix in DTS-HD Master Audio 5.1 is well-balanced and engaging. The voice actors also do a great job with their performances. There’s also an English dub mixed into DTS-HD Master Audio 5.1 that sounds just as good, but doesn’t have the same convincing performances, although the translations are adequate. Fireworks is a heartfelt, beautifully animated romance/fantasy that becomes a confused mess at times due to its time-jumping storyline. There’s still a lot to like here and perhaps several viewings may improve the standing of this one. As a group of boys try to settle a debate about whether fireworks look round or flat from the side during their town festival, one of the friends has a fantastical, time-twisting date with the girl of all of their dreams in this wonderfully animated, heartfelt, but confusing animated film from the producer of Your Name. The Blu-ray Combo Pack is light on special features but looks and sounds satisfying.